Part of the fun of celebrating the holidays is spending time with extended family and friends. We love having them in our home over the holidays, but there is always the worry about getting the house clean for company…and finding the time to do that in advance. Because really, who wants to race around picking up toys and scrubbing floors just before the guests arrive? Luckily, I’ve got a few Holiday Cleaning tips up my sleeve to prep for guests effortlessly. -Roll out the welcome mat — literally! When your guest show up with muddy or snowy boots, a special mat feels inviting and keeps messes outside. -Turkey and pumpkin pie just taste better when they’re baked in a clean oven. Skip the scrubbing and give your oven a quick steam bath: Fill a casserole dish with water and ½ cup of vinegar. Heat the oven to 350, let the water boil for 30 minutes, then let it cool down. Grab a paper towel and wipe the grease away. -While you’re simmering the sauce for your famous lasagna, wash the pasta pot and colander. Washing as you go will keep dishes from piling up in the sink so you can actually focus on enjoying your party. -Squirt some Mrs. Meyer’s dish soap down your garbage disposal and run it for 30 seconds to get rid of smells. The suds will clean your drain and spread the soap’s scent around your kitchen. -The kids wanted to help bake, but now there’s flour from one end of the kitchen to the other. Give your counters and appliances a quick wipe down with a damp microfiber cloth. I prefer the e-cloth from Grove Collaborative — it grabs dirt and germs like a magnet. -Bonus tip: Before the holidays are in full swing, stock up on essential cleaning supplies. Grove Collaborative delivers the best natural household products from Method, Mrs. Meyer’s, Seventh Generation and more right to your door. Talk about a holiday cleaning hack! -Who doesn’t love lathering up with a nice hand soap? 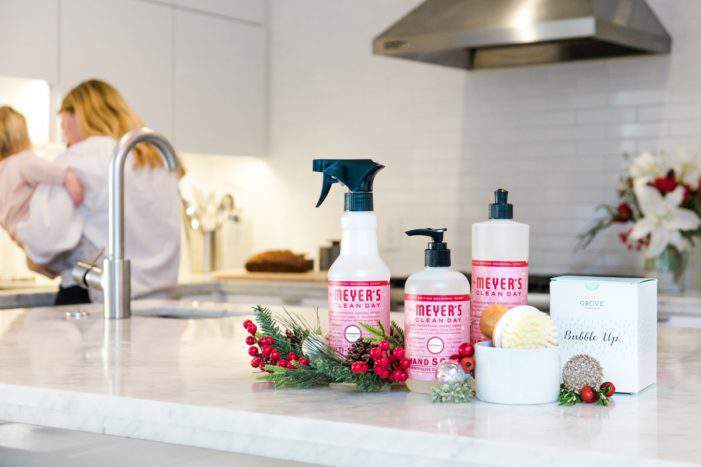 Put out one of these Mrs. Meyer’s holiday soaps and your guests won’t be able to resist. I have the Peppermint scent in my bathroom right now! -Fluffy towels make your bathroom feel like a five-star hotel. Toss towels in the wash with ½ cup of vinegar to refresh and soften them up. -Keep Aunt Kathy from rummaging through your cupboards by leaving extra toilet paper in sight. A pretty basket is a great place to stash a few rolls. -Don’t forget to empty the trash can. It’s an easy step, but it goes a long way toward making your house feel “clean”. -Just before guests arrive, light a few candles and flip off the light for instant ambiance. Candles add warmth, coziness, and cover up any less-than-fresh smells — plus they give off just enough light for guests to find your light switch in the dark. -Spritz couches and upholstery with a deodorizing room spray. I love Mrs. Meyer’s room spray — it smells like I just cleaned the whole house! -It’s tempting to wait until after the party to clean crumbs off your carpet, but a quick vacuum beforehand will make your house look polished. Sprinkle your carpet with baking soda before vacuuming to deodorize and revive the carpet fibers. -Your friends love Fido, but they don’t love having his fur stuck to their black pants! Put on a damp rubber glove and rub it across your couch. The fur will stick to the glove until you rinse it off. 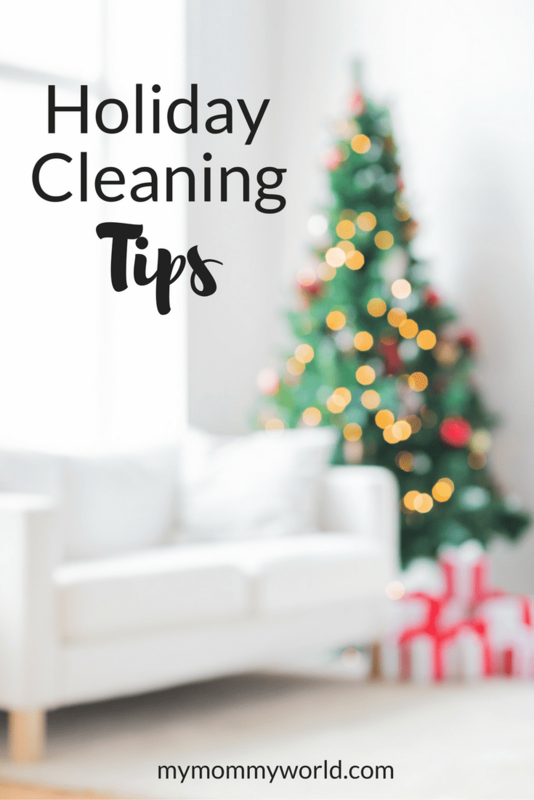 Getting your house all clean and ready for the holidays involves a lot of work, but using these tips, along with the time-saving service and free products from Grove Collaborative will help you to entertain your family and friends in a cozy and inviting home. Signing up for Grove couldn’t be easier…click here to go to their website to answer a few questions about your home and cleaning routines, pick which products you would like them to send, and they will be shipped for free directly to your door (no running out to Target for toilet bowl cleaner or hand soap!). New customers to Grove will get free Mrs. Meyer’s products, when you spend at least $20. If you’re a time-starved busy mom that prefers using environmentally-friendly products in the home that you share with your kids, you’ll love the benefits that you receive by using Grove Collaborative. I’ve personally been a customer for well over a year, and I love it…my home is cleaner and healthier and I save time and money. Such great tips, Erin. We love e-cloths at our house too.